Comparison of the Old & New Rites of Mass as researched by the Superior General of CCEW. Latin Mass attendees state that the above contribute to a more holy and reverent atmosphere with fewer distractions. 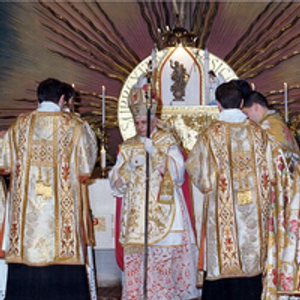 The last Pope to use the Latin Rite was His Holiness Pope Emeritus Benedict XVI. 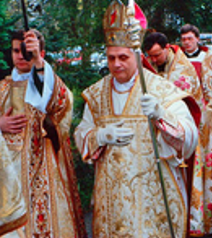 Photograph's above and below is His Holiness Pope Emeritus Benedict XVI who used during the 1990's and 2000 prior to and during his pontiff the Traditional Latin Mass. This prompted him to put in to force in 2007 the Motu Proprio. The text can be read here. A motu proprio (Latin for: "on his own impulse") is a document issued by the Pope on his own initiative and personally signed by him. When issued by the Pope, a motu proprio may be addressed to the whole Church, to part of it, or to some individuals. A document issued motu proprio has its legal effect even if the reasons given for its issuance are found to be false or fraudulent, a fact which would normally render the document invalid. Its validity is based on its issuance by the pope by his own initiative, not upon the reasons alleged. The first motu proprio was promulgated by Pope Innocent VIII in 1484. 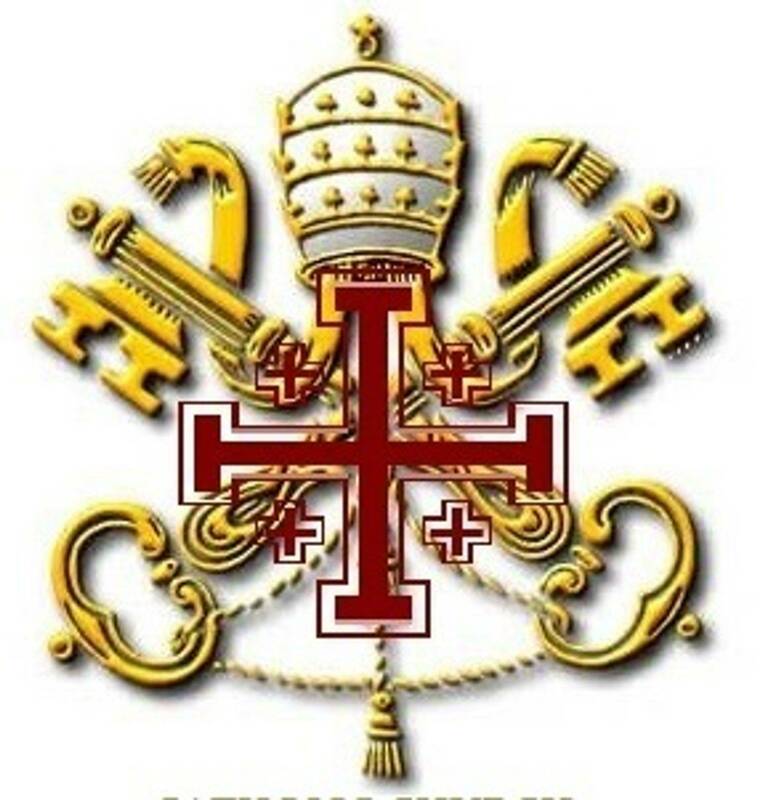 It continues to be a common form of Papal rescripts, especially when establishing institutions, making minor changes to law or procedure, and when granting favours to persons or institutions. 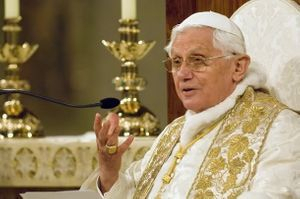 Pope Emeritus Benedict XVI allegedly feels that his “Summorum Pontificum“ decree has been “wounded” by Pope Francis’ decision to restrict the Latin Mass, which Benedict’s 2007 apostolic letter had explicitly allowed. 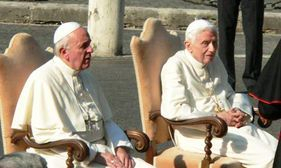 Italian journalist Sandro Magister reported that in “conversations with his visitors” Benedict has revealed his private opinion of the Francis-initiated limitation. Rorate Caeli reported on the “explosive revelation,” which came to light in Magister’s analysis of... the Francis pontificate to date, agreeing that Francis’ restriction does indeed undermine the authority of the Summorum Pontificum itself. Please note: This Mass wasn't created by men, but was merely codified by Pope St. Pius V, the last sainted pope until Pope St. Pius X. Please note: The commission even received 'assistance' from six Protestant (heretical) observers. Generally not,if so, it may replace the penitential rite. Please note: This division alone seems to place Scripture on par with the Holy Eucharist. Judica Me (Psalm 42), addressed to God "Judge me, O God, and distinguish my cause from the nation that is not holy: deliver me from the unjust and deceitful man..."
Greeting addressed to the people. e.g. "Good Morning! ", "The grace of our Lord Jesus Christ and the love of God and the fellowship of the Holy Spirit be with you all." "I confess to Almighty God, to blessed Mary ever Virgin, to blessed Michael the Archangel, to blessed John the Baptist, to the holy Apostles Peter and Paul, to all the Saints, and to you, Father, that I have sinned exceedingly, in though, word and deed: through my fault, through my fault, through my most grievous fault. Therefore I beseech blessed Mary ever Virgin, blessed Michael the Archangel, blessed John the Baptist, the holy Apostles Peter and Paul, all the Saints, and you, Father to pray to the Lord our God for me." "Lord, we have sinned against you. Lord, have mercy. Lord, have mercy. Lord, show us your mercy and love. And grant us your salvation." "I confess to almighty God, and to you, my brothers and sisters, that I have sinned through my own fault in my thoughts and in my words, in what I have done, and in what I have failed to do; and I ask blessed Mary, ever virgin, all the angels and saints, and you, my brothers and sisters, to pray for me to the Lord our God." Please note: Notice the reduced emphasis on the Blessed Virgin Mary and the Saints. Separate Confiteor; 'I Confess...' for Priest & People? Note: Having a single "penitential rite" places the priest on the "same level as the people"
"In the new Penitential Rite which begins the Mass, the Confiteor has now become collective; hence the priest is no longer judge, witness and intercessor before God." H.E. Cardinals Ottaviani and Bacci. Triple striking of one's breast; "mea culpa, mea culpa, mea maxima culpa" - "through my fault, through my fault, through my most grievous fault". May be none and or may be a single striking of the breast. None, rather than indicate "absolution", the priest asks for mercy. "Take away from us our iniquities, we entreat Thee, O Lord, that with pure minds we may worthily enter into the Holy of Holies. Through Christ our Lord. Amen." "We beseech Thee, O Lord, by the merits of Thy Saints, whose relics are here, and of all the Saints, that Thou wilt deign to pardon me all my sins. Amen." None their may be no relics in and or on the altar. Please note: This breaks with longstanding tradition, which required that relics be placed in altars - this practice is tied to the early Christian (Catholic) practice of celebrating Masses on the tombs of martyrs. "The frequent repetition of the Kyrie denotes in general the ardor, perseverance and importunity with which, impelled by the consciousness of our sinfulness and unworthiness, we implore mercy and assistance; then there is also therein a still higher, mystical and hidden meaning; wherefore the number three is thrice repeated. The three Divine Persons are separately and consecutively invoked: first, the Father by the Kyrie eleison; then, the Son by the Christe eleison; and finally, the Holy Ghost by the Kyrie eleison. The traditional ninefold repetition is replaced by a variety of options which are typically shortened (e.g. a sixfold repetition) and give the people - rather than the priest - the "last word". The shortened form dispenses with the symbolism in honour of the Trinity, as well as any other traditional symbolism. Furthermore, if said in English, the only Greek words are thereby entirely omitted from Mass. "Glory be to God on High. And on earth peace to men of good will. We praise Thee. We bless Thee. We adore Thee. We glorify Thee. We give Thee thanks for Thy great glory. Lord God, heavenly King, God the Father Almighty. Lord Jesus Christ, Only-begotten Son, Lord God, Lamb of God, Son of the Father. Thou Who takest away the sins of the world, have mercy on us. Thou Who takest away the sins of the world, receive our prayer. Thou Who sittest at the right hand of the Father, heave mercy on us. For Thou alone art holy. Thou alone art the Lord. Thou alone, O Jesus Christ, art most high. With the Holy Ghost, in the glory of God the Father. Amen." "Glory to God in the highest, and peace to his people on earth. Lord God, heavenly King, almighty God and Father, we worship you, we give you thanks, we praise you for your glory. Lord Jesus Christ, only Son of the Father, Lord God, Lamb of God, you take away the sins of the world: have mercy on us. you are seated at the right hand of the Father: receive our prayers. For you alone are the Holy One, you alone are the Lord, you alone are the Most High, Jesus Christ, with the Holy Spirit, in the glory of God the Father. Amen." Please note: Although the prayers are similar, at least one notable difference may be found (e.g. the 'Tridentine' Rite prayer indicates "peace to men of good will" while the Novus Ordo rite indicates "peace to his people on earth"). Traditional Mass Propers. e.g. Collect, Preface. Please note: Many prayers used in the Traditional Latin Mass date back to antiquity, including prayers from Pope St. Leo the Great and Pope St. Gregory the Great. "Most of the traditional prayers have been replaced, re-worded (e.g. stripped of 'negative' terms, references to the supernatural, etc. ), deleted, left to choice, gutted, etc." Please note: In contrast to the traditional prayers "distinguished as much for the beauty and perfection of its form as for the copiousness and depth of its contents" (Gihr), the new prayers have been charged with banality and lack of depth. "I Believe in one God, the Father Almighty, Maker of heaven and earth, and of all things visible and invisible. And in one Lord Jesus Christ, the Only-begotten Son of God. Born of the Father before all ages. God of God, Light of Light, true God of true God. Begotten, not made: consubstantial with the Father; by Whom all things were made. Who for us men, and for our salvation, came down from heaven (kneel) AND WAS INCARNATE BY THE HOLY GHOST OF THE VIRGIN MARY: AND WAS MADE MAN (rise). He was crucified also for us, suffered under Pontius Pilate, and was buried. And on the third day He rose again according to the Scriptures. And He ascended into heaven, and sitteth at the right hand of the Father. And He shall come again with glory to judge the living and the dead: of Whose kingdom there shall be no end. And in the Holy Ghost, the Lord and Giver of Life: Who proceedeth from the Father and the Son. Who together with the Father and the Son is adored and glorified: Who spoke through the Prophets. And in One, Holy, Catholic and Apostolic Church. I confess one Baptism for the remission of sins. And I look for the resurrection of the dead, and the life of the world to come. Amen." "We believe in one God, the Father, the Almighty, maker of heaven and earth, of all that is seen and unseen. We believe in one Lord, Jesus Christ, the only Son of God, eternally begotten of the Father, God from God, Light from Light, true God from true God, begotten, not made, one in Being with the Father. Through him all things were made. For us men and for our salvation he came down from heaven (bow): by the power of the Holy Spirit he was born of the Virgin Mary, and became man (end of bow). For our sake he was crucified under Pontius Pilate; he suffered, died, and was buried. On the third day he rose again in fulfillment of the Scriptures; he ascended into heaven and is seated at the right hand of the Father. He will come again in glory to judge the living and the dead, and his kingdom will have no end. We believing the Holy Spirit, the Lord, the giver of life, who proceeds from the Father and the Son. With the Father and the Son he is worshiped and glorified. He has spoken through the prophets. We believe in one holy catholic and apostolic Church, We acknowledge on baptism for the forgiveness of sins, We look for the resurrection of the dead, and the life of the world to come. Amen." Please note: Although the prayers are similar, at least two notable differences may be found [e.g. professing the faith of one's neighbour ("we" vs. "I") and the substitution of the very precise term "consubstantial" for "one in being")]. Note: It is expected that the incorrect translation of the above into "we" instead of "I" will be corrected in upcoming translations. However the fact remains that this prayer has been mistranslated for decades (even though the mistranslation was well known). Prayer Intentions In Mass "General Intercessions". (5) are truly unnecessary if the Mass includes all appropriate intentions in its text, as the 'Tridentine' Rite does. Furthermore, the people generally have become so undiscerning that one could probably insert the prayer intention that "The church catches on fire" and the people would parrot the response "Lord, hear our prayer". Please note that this procession often involves poorly dressed persons who were accosted and asked to take up the gifts as they walked in the door. The persons may be irreverent, they may living in sin, they may not have been to Mass in years, etc. Further, those who bring the gifts may include women, children, and even non-Catholics. Note that this is also distracting as the parishioners look to see who has been "selected" for this "honour". The number of distractions created by this practice is truly incalculable. Please note: The 'dogmatically rich' and clearly sacrificial offertory prayers were essentially replaced in the New Mass by the "presentation of the gifts" which even incorporates text based on a 'Jewish meal prayer'. Note that the heresiarch Luther also removed the offertory prayers - he referred to them as the "abomination called the offertory and from this point almost everything stinks of oblation." Please note: Bells serve to draw one's attention to the most important points of the Mass. Possibly twice, once for each consecration. Lavabo (Ps. 25:6-12) "I will wash my hand among the innocent, and I will encompass Thine Altar O Lord..."
No, replaced with: "Lord, wash away my iniquity; cleanse me from my sin." Invocation of the Saints Shortly before the Consecration. "In communion with, and honouring the memory in the first place of the glorious ever Virgin Mary Mother of our God and Lord Jesus Christ; also of blessed Joseph, her Spouse; and likewise of Thy blessed Apostles and Martyrs, Peter and Paul, Andrew, James, John, Thomas, James, Philip, Bartholomew, Matthew, Simon and Thaddeus, Linus, Cletus, Clement, Sixtus, Cornelius, Cyprian, Lawrence, Chrysogonus, John and Paul, Cosmas and Damian, and of all Thy Saints. Grant for the sake of their merits and prayers that in all things we may be guarded and helped by Thy protection. Through the same Christ our Lord. Amen." Omitted in most "Eucharistic Prayers". Where it remains, nearly all of it is indicated as "optional". At the Consecration of the Host, the priest makes a reverent, low bow and slowly pronounces the words of consecration over the bread. This is followed by a genuflection, adoration and elevation, and another genuflection. Over the Chalice, the priest also bows, and afterwards genuflects, adores, elevates the Chalice, and genuflects again. During this time, the bell may be rung a total of ten times. At the Consecration, the words are usually pronounced in loud voice in "narrative" fashion. The priest may not even look at the bread while consecrating and may even "consecrate in mid air". A bow and elevation may occur after the consecration. During this time, the bell may be rung a couple of times (e.g. once at the consecration of the bread, and once at the consecration of the wine), if at all. Mystery of Faith. "Mysterium Fidei"
"You have asked (indeed) who has added to the form of the words which Christ Himself expressed when He changed the bread and wine into the body and blood, that in the Canon of the Mass which the general Church uses, which none of the Evangelists is read to have expressed... In the Canon of the Mass that expression, 'mysterium fidei,' is found interposed among His words.... Surely we find many such things omitted from the words as well as from the deeds of the Lord by the Evangelists, which the Apostles are read to have supplied by word or to have expressed by deed... From the expression, moreover, concerning which your brotherhood raised the question, namely 'mysterium fidei,' certain people have thought to draw a protection against error, saying that in the sacrament of the altar the truth of the body and blood of Christ does not exist, but only the image and species and figure, inasmuch as Scripture sometimes mentions that what is received at the altar is sacrament and mystery and example. But such run into a snare of error, by reason of the fact that they neither properly understand the authority of Scripture, nor do they reverently receive the sacraments of God, equally 'ignorant of the Scriptures and the power of God' [Matt. 22:29].... Yet 'mysterium fidei' is mentioned, since something is believed there other than what is perceived; and something is perceived other than is believed. For the species of bread and wine is perceived there, and the truth of the body and blood of Christ is believed and the power of unity and of love...Therefore, we believe that the form of words, as is found in the Canon, the Apostles received from Christ, and their successors from them..." Pope Innocent III, 1202 A.D. Please note: The traditional Mystery of Faith may be offensive to Protestants who may not believe in Transubstantiation or the Real Presence, while the new "mystery of faith" may be generally agreeable to Protestants. Deemphasizing the traditional Mystery of Faith (and, in fact, replacing it with text that seems to contradict the Real Presence - e.g. saying "Christ will come again" when Christ is already truly present on the altar) may result in reduced belief in the Real Presence, which must be believed by the faithful. As St. Paul says in 1 Cor.11:29: "For anyone who eats and drinks without discerning the body, eats and drinks judgment on himself." Protection shown by Priest for Particles of the Host Which May Remain on His Fingers. From the Consecration until after Holy Communion, the priest never disjoins his fingers and thumbs, except to take the Host. No such protection. In fact, the priest may even shake hands with parishioners after the Consecration without even checking his fingers for sacred particles. A prayer by the priest: "And now, O Lord, we, Thy servants, and with us all Thy holy people, calling to mind the blessed Passion of this same Christ, Thy Son, our Lord, likewise His Resurrection from the grave, and also His glorious Ascension into heaven, do offer unto Thy most sovereign Majesty out of the gifts Thou hast bestowed upon us, a Victim which is pure, a Victim which is holy, a Victim which is spotless, the holy Bread of life eternal, and the Chalice of Everlasting Salvation. Deign to look upon them with a favourable and gracious countenance, and to accept them as Thou didst accept the offerings of Thy just servant Abel, and the sacrifice of our Patriarch Abraham, and that which Thy high priest Melchisedech offered up to Thee, a holy Sacrifice, an immaculate Victim. Humbly we beseech Thee, almighty God, to command that these our offerings be carried by the hands of Thy holy Angel to Thine Altar on high, in the sight of Thy divine Majesty, so that those of us who shall receive the most sacred Body and Blood of Thy Son by partaking thereof from this Altar may be filled with every grace and heavenly blessing..."
A "Memorial Acclamation" by the priest and people (often elongated by the choir), such as: "Christ has died, Christ is risen, Christ will come again. Most "memorial acclamations" may tend to cast doubt on the Real Presence since instead of referring to the "Victim" (as in the 'Tridentine' Mass) who is made truly present on the altar, they skip over His presence in the Holy Eucharist - as if It was not truly there - and refer instead to Jesus' future coming - e.g. "Christ will come again", "until you come in glory", etc. Sung by the priest alone, in the Church's official language, Latin. High Mass. May be sung by the choir, it is usually said or sung in any vulgar language, with very limited use of the Latin language. Recitation of 'Amen' After Lord's Prayer. "The word amen, with which the Lord's Prayer concludes, contains, as it were, the germs of many of these thoughts and reflections... Indeed, so frequent was this Hebrew word in the mouth of the Saviour, that it pleased the Holy Ghost to have it retained the Church of God. Its meaning may be said to be: Know that thy prayers are heard. It has the force of a response, as if God answers the suppliant, and graciously dismisses him, after having favourably heard his prayers. This interpretation has been approved by the constant usage of the Church of God. In the Sacrifice of the Mass [in the Traditional Latin Rite], when the Lord's Prayer is said she does not assign the word amen to the server who answers: But deliver us from evil. She reserves it as appropriate to the priest himself, who, as mediator between God and man, answers Amen, thus imitating that God has heard the prayers of His people. This practice, however, is not common to all the prayers, but is peculiar to the Lord's Prayer. To the other prayers the server answers Amen, because in every other this word only expresses assent and desire. In the Lord's Prayer it is an answer, intimating that God has heard the petition of His suppliant." Catechism of the Council of Trent. No 'Amen',at least until after the 'Protestant-preferred' ending: "For the Kingdom, the power and the glory are yours, now and forever". Words following the 'Our Father' Prayer. English Translation. "Deliver us, we beseech Thee, O Lord, from all evils, past, present and to come, and by the intercession of the blessed and glorious Mary, ever Virgin, Mother of God, together with Thy blessed Apostles Peter and Paul, and Andrew, and all the Saints, mercifully grant peace in our days, that through the bounteous help of Thy mercy we may be always free from sin, and safe from all disquiet." "Deliver us, Lord, from every evil, and grant us peace in our day. In your mercy keep us free from sin and protect us from all anxiety as we wait in joyful hope for the coming of our Saviour, Jesus Christ." Please note: Afterwards, the prayer is concluded with the Protestant-preferred ending: "For the Kingdom, the power and the glory are yours, now and forever". Also note that all references to the Blessed Virgin and the saints have been removed. Sign of Peace Among Laity. Please note: In the early day of Christianity, a "kiss of peace" among the laity was reserved for those members of the Church who were in the state of grace. It was not given indiscriminately to just anyone. Note that in the Novus Ordo Mass, this "sign of peace" is generally given to anyone in the vicinity, be they Jewish, Protestant, adulterers, abortionists, those living in sin, etc. - thereby sending a very wrong message. Further, this practice is very distracting and requires that the laity - and possibly even the priest - turn their backs on the Holy Eucharist, which lays alone on the altar. It also tends to take one's focus away from Christ and turns the Mass from being a solemn sacrifice to a "jovial party". It is also an unsanitary practice (especially for those who will, in a few moments, proceed to take Holy Communion in the hand), and involves strange men and women inappropriately making physical contact with each other and with children. Sadly, this practice has created so much distraction that many people consider this the highlight of the Mass. "O Lord Jesus Christ, Son of the living God, Who, by the will of the Father and the cooperation of the Holy Ghost, has by Thy death given life to the world: deliver me by this, Thy most sacred Body and Blood, from all my iniquities and from every evil; make me cling always to Thy commandments, and permit me never to be separated from Thee. Who with the same God, the Father and the Holy Ghost, livest and reignest God, world without end. Amen." "Let not the partaking of Thy Body, O Lord Jesus Christ, which I, though unworthy, presume to receive, turn to my judgment and condemnation; but through Thy mercy may it be unto me a safeguard and a healing remedy both of soul and body. Who livest and reignest with God the Father, in the unity of the Holy Ghost, God, world without end. Amen." No prayers specified in Missal. "Lord, I am not worthy..."Domine, non sum dignus. Said one time by the priest and people together. Confiteor / Absolution just prior to Holy Communion. Although it may be omitted. No. Communicants receive the Holy Eucharist kneeling, unless physically unable. "I bend my knee to the Father of my Lord Jesus Christ, from whom all paternity in heaven and on earth is named" (St. Paul, Eph. 3:14). "Why is it these same people who stand upright to receive their Lord Jesus would almost instinctively know better than to adopt this very same posture when being presented to mere earthly royalty?" Paten used in distribution of Holy Communion. PLEASE Note: When a paten is not used, particles of the Holy Eucharist may fall to the floor and be trampled on. Remember that even the tiniest particle of the Eucharist contains Christ's Body, whole and entire. Said by the priest to each communicant: "Corpus Domini nostri Jesu Christi custodiat animam tuam in vitam aeternam. Amen." In English: "May the Body of Our Lord Jesus Christ preserve your soul unto life everlasting. Amen." Said by the priest or the 'lay minister' to each communicant: "The body of Christ" (or "The blood of Christ"). Note: It is common to see neither "body" or "blood" be capitalized in the 'missalette'. Response of Communicant at Communion. The priest says "Amen", the recipient adores in silence, e.g. by silently reciting "My Lord and my God". Please note: The focus on external actions may distract persons from true interior adoration of the Holy Eucharist and focusing on the Real Presence. Reception of Holy Communion by Laity. Recollected, kneeling at altar rail unless physically unable. Communion received directly from priest on Communicant's tongue. Sacred particles collected on paten. Communicant may remain at altar rail for brief moment without "holding up the line"
Often standing, with hands sticking out in a somewhat hurried fashion (due to awareness of people waiting in line directly behind the Communicant). The Holy Eucharist is frequently placed by a lay 'minister' on the Communicant's bare (unwashed, un-consecrated) hand. Communicant may take the Host from his hand and put It in his mouth, self-communicating. Usually the Communicant fails to check for sacred particles, which thereby end up on the floor. Communicant generally cannot pause after reception of Holy Communion without "holding up the line"
Please note: Prior to receiving Holy Communion, Communicant may have bowed - usually, however, the bow is made to the back of the Communicant in front of them rather than bowing directly in front of the Holy Eucharist, leaving open to question what the person was actually bowing to. A mere earthly dignitary would not accept that someone who came to meet them didn't bow directly in front of them, but rather bowed behind someone else who was standing in front of them. "May Thy Body, O Lord, which I have received and Thy Blood which I have drunk, cleave to my inmost parts, and grant that no stain of sin remain in me; whom these pure and holy Sacraments have refreshed. Who livest and reignest world without end. Amen." "...it is impossible to ignore how ritual gestures and usages expressing faith in the Real Presence have been abolished or changed. The Novus Ordo eliminates... Purification of the priest's fingers over the chalice... All these suppressions only emphasize how outrageously faith in the dogma of the Real Presence is implicitly repudiated." H.E. Cardinals Ottaviani and Bacci.. Please note: This recalls to mind the Jesus' last words on the Cross: "It is consummated" (Jn. 19:30), a most appropriate ending for the solemn re-representation of Calvary. A line such as "The Mass is ended, go in peace" or "Go in peace to love and serve the Lord" is usually said by the priest in a regular tone with no solemnity. Please note: These final words do not recall to mind the Passion of Christ and do not emphasize that a sacrifice has just been completed. 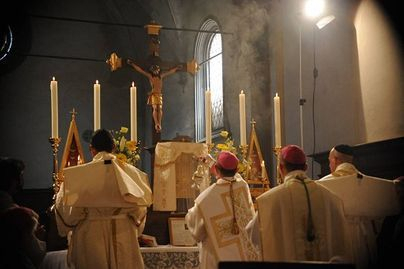 In fact, considering the "festive" manner in which many Novus Ordo Masses are conducted, the traditional, solemn "Ite, missa est" may seem out of place. "May the tribute of my homage be pleasing to Thee, O most holy Trinity. Grant that the Sacrifice which I, unworthy as I am, have offered in the presence of Thy Majesty, may be acceptable to Thee. Through Thy mercy may it bring forgiveness to me and to all for whom I have offered it. Through Christ our Lord. Amen. May Almighty God bless you: The Father, the Son, and the Holy Ghost. Amen." May vary e.g. "May almighty God bless us, the Father, and the Son, and the Holy Spirit. Amen.". Please note: The Last Gospel in the 'Tridentine' Mass emphases the Incarnation and gives a "majestic profession of faith in the Divinity of Christ." No. The Mass clearly expresses Catholic doctrine which Protestants reject. Traditionally, Protestants are very hostile to this Mass, e.g. considering it "a manifest wickedness, an horrible idolatry, and a foul abomination". Martin Luther's thoughts on the Mass: "I declare that all the brothels (though God has reproved them severely), all the manslaughters, murders, thefts, and adulteries have wrought less abomination than the popish mass." Calvin's thoughts on the Mass: "...this mass, however much it may be varnished and adorned, offers the greatest insult to Christ, suppresses and conceals his cross, consigns his death to oblivion, deprives us of the benefit resulting from it, and invalidates and destroys the sacrament which was left as a memorial of that death; will there be any roots too deep for this most powerful axe, I mean the word of God, to cut in pieces and eradicate? will there be any varnish too specious for this light to detect the evil which lurks behind it?" "...for on many points [the New Mass] has much to gladden the heart of even the most modernist Protestant." H.E.Cardinals Ottaviani & Bacci. Please note: Ironically, the changes in the Mass, designed to foster ecumenism, have brought us further from the Orthodox and closer to Protestants (heretics). Please note: The stability of the Traditional Mass well-reflects God's un-changeableness, and appears geared to please God. Please note: Since the New Mass may be adapted to people - who change all the time - it "will never stay the same". The New Mass appears more geared to please man, who is never satisfied and therefore always wants change.